The ROARING FORTIES™ SAVER (Survival Aid Vest Equipped Raft) system is designed for use by air pilots & crew as a personal marine survival system. 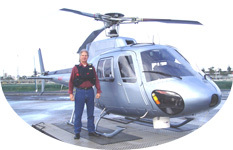 This system was conceived by Roger Dundas, a former Australian Army helicopter pilot & also a former helicopter camera pilot from the Australian Broadcasting Corporation (ABC) in collaboration with Safety Marine Australia. With the need to travel Bass Strait at low heights, he found himself and other helicopter pilots wanting an unobtrusive vest with all the qualities for short-term survival at sea. Pilots & Crew of Fixed wing planes. The ROARING FORTIES™ SAVER survival vest casing is constructed from fire resistant Nomex or Polyurethane fabric. Reflective tape is attached to the collar and a spray hood is installed inside the collar of the vest. The spray hood helps to reduce the amount of water contact on the face from the waves and wind spray. 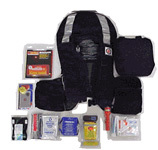 There are pockets to stow survival equipment such as an EPIRB, water, signaling mirror, sea-marker pack or mini-flare kit. 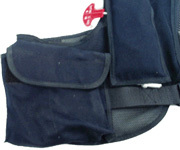 The vest has a pocket on the upper left breast to hold an activated PLB. The bladder is created from high performance fabric from the USA. It is welded with a 6mm bar welder. The SAVER survival vest has a buoyancy of >160 Newtons and provides a comfortable freeboard of at least 110 mm. The ROARING FORTIES™ SSSC is stowed in a compact lightweight valise. The valise is made from fire resistant Polyurethane/Nomex fabric as well. The SSSC is retained within its valise by hook and loop strips around its perimeter, which will open automatically by a 50g CO2 gas system when activated or triggered. The SSSC is designed to provide short-term protection (up to 72 hours) for pilot, aircrew and instructed passenders downed in a marine environment. The SSSC buoyancy comprises of two inflatable chambers. The main chamber is normally inflated via a Halkey-Roberts operating head and a disposable gas cylinder. In the unlikely event of the stored pressure gas system failing, the main chamber may be inflated orally through a Halkey-Roberts oral inflation tube. A second chamber is inflated orally through a separate oral inflation tube. This section when inflated in conjunction with the main chamber also provides hypothermia protection to the occupant through its quilted construction. The craft when inflated resembles a triangular canoe and can adequately support a person of up to 115kg in weight. Because of its low seating position - with most of the occupant below the water line - the craft has excellent stability. Attached to the lower rear of the SSSC is a small drogue with approximately three meters of nylon line. The purpose of the drogue is to hold the rear of the SSSC in prevailing wind and sea thus stabilizing the ride and at the same time reducing the SSSC drift. - Channel 2,7,9 & 10 helicopter pilots & Crews. - Surveillance & Off-shore pilots including Bristow Helicopter Pilots.